Click here for more stories by Kelly Gay. Charlie Madigan — (2009-2012) Publisher: Divorced mother of one, Charlie Madigan, lives in a world where the beings of heaven and hell exist among us, and they aren’t the things of Sunday school lessons and Hallmark figurines. In the years since the Revelation, they’ve become our co-workers, neighbors, and fellow citizens. Charlie works for ITF (Integration Task Force). It’s her job to see that the continued integration of our new “friends” goes smoothly and everyone obeys the law, but whena new off-world drug is released in Underground Atlanta, her daughter is targeted, and her ex-husband makes a fateful bargain to win her back, there’s nothing in heaven or earth (or hell for that matter) that Charlie won’t do to set things right. I thoroughly enjoyed The Better Part of Darkness by Kelly Gay. 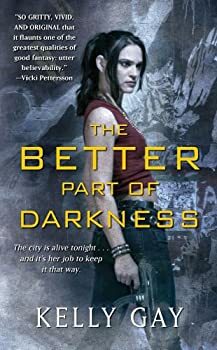 Charlie Madigan is a policewoman and a single mother in a dystopian Atlanta in which we share our world with beings from two magical realms that are vaguely reminiscent of heaven and hell. Shortly before the novel starts, Charlie is beaten to death and brought back to life with a new set of nightmares and supernatural powers she must come to terms with if she hopes to solve the mystery. The story begins when a pre-teen friend of her daughter is found comatose from inhaling a magical drug. Charlie must investigate.